A devoted couple who have been married for 67 years face being torn apart by social services in a row over their care. Frank Springett, 91, could be split from his beloved wife Mary, 86, in a move which would “devastate” the couple, their family say. Their case offers a snapshot into the crisis facing adult care in the UK which faces a £2 billion black hole due to Tory cuts. Both Frank and Mary suffer serious health problems, but their family say they are still happily living together in a care home which caters for their every need. The couple even renewed their wedding vows in May — on the day of Prince Harry and Meghan Markle’s wedding — with a cake, photographer and vicar performing the ceremony. Mary suffers from severe Alzheimer’s, while Frank has artritis, the muscle stiffness condition polymyalgia rheumatica and is almost totally deaf. The family is keeping the funding row secret from Frank and they fear the stress of being separated from his wife could kill him. The couple sold their £156,000 home in Henley in Arden earlier this year to help fund their £8,000-a-month care bills. But now their cash is running low and in a few months time they face the prospect of being separated from each other for the first time in seven decades. Daughter Joanne Downes, 57, said social services told them her parents would be split up and moved to different homes. She said: “It would devastate my mother if my father was not with her, and vice versa. “They are a couple who have been together 70 years, married for 67 years and never, ever spent time apart. Barbara Keeley, Labour’s Shadow Cabinet Minister for Social Care, said: “This is the shocking extent of the Tory Government’s social care crisis: a devoted older couple threatened with separation because of the funding black hole facing councils. “More and more older people face the uncertainty of how to pay for care because of the Tories’ shameful cuts to council budgets and their failure to fix a care crisis they have created. “Labour in Government will finally end the Tory social care crisis: we will start to bring stability to the social care system by immediately investing an additional £8 billion and place a lifetime cap on care costs so no one faces losing everything as they do now. Experts say Britain’s beleaguered care system is underfunded by £2 billion with growing numbers of pensioners have been forced to pay soaring care home bills. A soaring number of care home closures – more than 12 each month last year – has added to the problem. Recent research by the Association of Directors of Adult Social Services found care for vulnerable adults are on the verge of collapse in some areas of England, despite the provision of extra government funding. The report revealed English councils plan to push through social care cuts of £700m in 2018-19, equivalent to nearly 5% of the total £14.5bn budget. Since 2010, social care spending in England has shrunk by £7bn. The government say they have provided an extra £9.4bn over three years to help deal with the pressure. 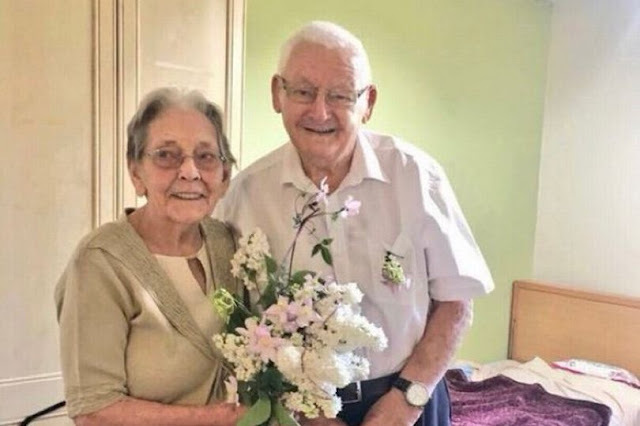 Frank and Mary’s family claim the loving couple face being split because of a row with Solihull Council, in the West Midlands, over the provision of care. Mary suffers from severe Alzheimer’s which has been getting progressively worse. She had been wandering out of their old home and needed to be helped back home by neighbours and on one occasion the postman. She is also incapable of holding a conversation. Frank also has his health problems and needs a walking frame to get around. His hands are swollen due to arthritis, he needs help with the toilet and is almost totally deaf. They lived independently in their own home until March this year when their family took the decision to move them into a care home due to their failing health. The couple are currently still together in the Cedar Lodge Care Home, close to their family. But they face being split as the council has offered to pay costs towards Mary’s care - but they say retired factory worker Frank is able to look after himself. Their children, Roderick and Joanne, are battling to keep them together. A third child, Gerald, tragically died of a brain tumour in 2005. The family has made three appeals to social services which have all concluded they should be separated. They are now taking their case to the ombudsman. Joanne said because her parents owned their own home they were not eligible for any help paying care home fees. They sold the house for £156,000 and the proceeds are currently paying £975-per-week for Mary’s care and £925-per-week for Frank. Planning ahead the family contacted Solihull social services to ask about their future options when the money runs out. She said: “To date we’ve had no funding from social services at all, which we understand because we have money to pay. “They’ve said they’ll pay £500 per week towards my mom’s care - but that the family will need to pay a top-up fee of £475 a week. She added: “The money is running out. I have constantly been in touch with Solihull council but they never answered my emails or phone calls. The council failed to provide the care promised leaving us no choice. Joanne said both her mum and dad needed the round-the-clock care Cedar Lodge provided. This was when social services first became involved with the couple as Mary was also suffering from Nodular Porigo - a nasty type of eczema - and needed to undergo sunlight treatment at the hospital. Joanne said: “As time passed mom’s Alzheimer’s was getting worse and she was becoming more and more forgetful. My father was insistent at this time that he could cope. She said they started to realise Frank was struggling to cope: “He is not a moaner and that is part of the problem, he will never admit he is in pain. “His deafness made communication really difficult when he was having problems with Mom, because he couldn’t ring me to tell me, as he couldn’t hear me. “We got to a point last year when mom was escaping out of the house and the neighbours were bringing her back. “When my Mom’s condition deteriorated she would be extremely emotional, she would lie on the floor and refuse to get up. “My dad would get very upset about this and he would call me at work and I would have to come over in my lunch hour to try and calm things down. In October last year they requested a further assessment from Social Service to get some more help. Over Christmas Frank finally recognised he was struggling: “By Christmas I was exhausted and so was Dad. Dad’s mobility was extremely bad, he also had bad psoriasis, I think due to stress, and he was becoming prone to water infections. “My mom was oblivious to the situation, obviously due to the illness. Over Christmas my brother and I spoke with our father and he finally agreed that he was not coping at all. He understood that he could not look after mom or himself at home any more. But she claimed they then struggled to get the help they needed from social services. “Social services told us we then had to make a fresh application for Dad as only mom was under their care. The couple were given a care package - but Joanne said they had repeated problems when the carers failed to arrive at their home. Frustrated by the lack of support the family took the decision to put Frank and Mary in the care home, using their own cash to pay. “After long discussions we all agreed that their house would be sold and we would use the money to self-fund them both in a care home. “We found Cedar Lodge, a lovely home. We decided we would move them in to the home as the situation at home was untenable, mom had got out of the house on a number of occasions and dad had had a fall on the drive trying to get her back in. But once they were in the home social services came back and said the couple could be separated. “They said my mom and dad can be separated – my mom can go into a home but my dad must stay at home. They said they would put a care plan in place for dad. “We said that we could not risk a care plan – as the previous one for mom had failed miserably and my dad was a liability at home. What would happen if he fell? She added: “Solihull Social Services say they won’t pay anything for my father’s care fees because he can look after himself. They say he can live in a flat in the community and have carers come to him. “They haven’t given a location. I told them that the reason I put them in a home in the first place was because the care package wasn’t working and that I had no faith in the system. I asked how he would visit my mom and they did not have an answer. “They have said they will pay £500 per week for my mom’s care-even though there is no suitable care home for that much. “I have asked them what about my parents emotional needs. A spokesman for Solihull Council said they were working with the family to try and resolve the situation: “We understand that couples who have been married a long-time often wish to stay together when one of them moves into residential care. “We respect their right to do so. In some situations people decide to fund themselves, and we do our best to make them and their family aware of the financial implications of this. “If people’s care needs or financial circumstances change as time passes, we would reassess their situation. The family has also contacted local MP Dame Caroline Spelman for help. She said: “I am aware of the case of Mr. and Mrs Springett. As their constituency Member of Parliament I have regular raised their case with the local authority since the family first contacted me in April and have offered advice and support.